This week we're highlighting Profesora Sonia Cruz! 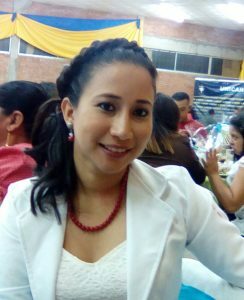 Even though she has only been a part of the Foundation for about a year and a half, this September she won the distinction of Instituto Oscar Cardenal Rodriguez's (our monolingual college-prep high school) Teacher of the Year! Congratulations and thanks for all of the work that you and your family do for the Foundation and our community. When did you begin working for the Olancho Aid Foundation? My husband is the Water Project Coordinator for the Foundation. I am the media teacher at Instituto Cardenal Oscar Rodriguez, our monolingual college-prep high school. It has been a good experience as I have built relationships both with my colleagues and the students. I like developing my abilities and skills with the students through my classes. Do you have a favorite memory from your time at Olancho Aid? I enjoy spending the time we spend with students in rural areas of Juticalpa. They are sweet, loving, caring kids. I’m a very happy and responsible person.